The holidays are here and I recently did some online holiday shopping. And I’m not alone as by the looks of it, 2012 is on track to be the biggest year yet for online retailers. After completing my recent purchase from Zazzle.com, which is a site that offers customized clothing and personalized gifts, being in online marketing, I was struck by how aggressively Zazzle sought additional sales. Yet they did it in a smart, tactful way. The first thing Zazzle did when the purchase confirmation appeared was have a popup saying share what you bought on Facebook and save on 20% on your next order (#1). That sounded great but too bad I had just bought a gift for my wife. I wouldn’t exactly want to share that information on Facebook. But I found it interesting that the retailer was leveraging a deal and their relationship with me to gain highly positive visibility (and low cost advertising) through my network of friends and family. The emergence of social networks and online marketing has changed the dynamics of marketing in many ways. It is a whole new paradigm. The traditional media advertising model was typically to blast your message out there and let it funnel down to that relatively small group of people who want to use your product or service. 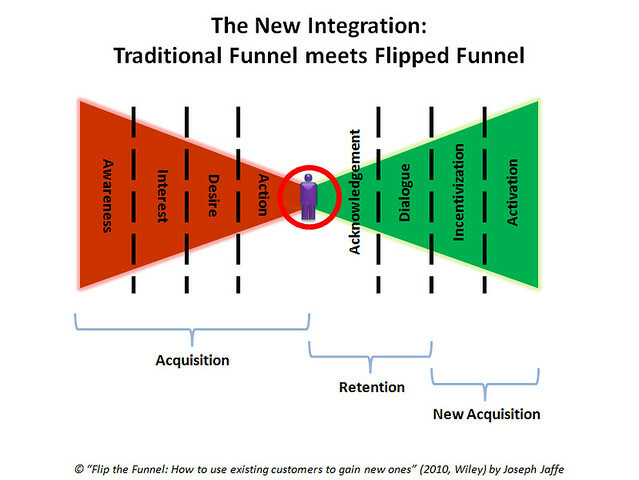 The Internet and the emergence of social networks have flipped the funnel around. If you are able to gain a core group that are zealous advocates for your product or service, they can spread that message outwards reversing the path of that funnel upward. It can be a much cheaper, efficient, and effective form of advertising. Returning to my Zazzle experience, I closed the Facebook offer pop up and I was inundated with other offers on the page to make additional purchases. There were pictures of other items Zazzle offered saying ‘you may be also be interested in’ (#2). There was, of course, a graphic link with an offer to buy gift certificates for family and friends (#3). I was also offered the chance to “spread the love” which was an email form on Zazzle’s website where you can send out a message to friends and family and share your purchase experience, with an option to link to a picture of the item (#4). In exchange, you would receive a small gift from Zazzle. And last but not least, there was an opportunity to sign up for more email deals (#5). While I was not tempted by these offers, I was impressed with Zazzle’s numerous but shrewd attempts to prompt a customer to make additional purchases or share their purchase experience with others. Are you doing enough to reconvert from your existing customers and get the funnel pointed in the direction you want it to go? Is this the Social Media Bubble?